Ford, one of the renowned car manufacturers commenced its operations in 1995 in India. It has its production facilities located in Chennai and Sanand. At present, the firm has above 370 sales and service outlets located in over 200 cities in India. Why is it Important to Insure Your Ford Car? As per the Motor Vehicles Act, it is mandatory for every vehicle plying on the Indian terrain to be insured with at least a third-party liability cover. Also, having a car insurance assures you with the necessary financial support at the time of a mishap. A comprehensive car insurance protects you financially from own damage liabilities as well as third-party liabilities incurred as a result of a mishap. A third-party car insurance protects you financially from third-party liabilities alone that you incur as a result of a mishap. You can purchase a new car insurance or renew your existing policy before it expires online via third-party insurance websites or insurer official websites. You can purchase a new car insurance or renew your existing policy prior to its expiry by visiting the nearest branch office of the insurer or meeting with an insurance agent. Take your car to the nearest garage and get it repaired. Post repairs, the insurer will pay the garage for the repairs in case of a cashless claim request. Damage or loss as a result of wars, mutiny, nuclear perils, etc. 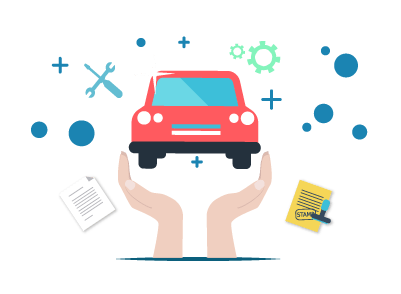 What can I do with my existing car insurance when I sell my car? Who all should I inform when I install my car with a CNG/LPG kit? You need to inform the RTO as well as your insurer when installing an LPG/CNG kit in your car. What is an endorsement in car insurance? An endorsement is a change/correction you incorporate into your car insurance policy. Can I renew my car insurance policy after its expiry? Yes, you can renew your car insurance policy after it expires. Can the No Claim Bonuses (NCB) I have accumulated driving a company vehicle be used? You can use the accumulated bonuses provided the company transfers the car to your name.